Editor’s Note: The first Public Forum on Unity and the Assembly of Bishops was hosted by Orthodox Christian Laity on October 25 2012 at St George Antiochian Orthodox Church, Washington D.C. Bishop Maxim, Serbian Orthodox Church Western Diocese, Alhambra, CA and Protodeacon Peter Danilchick were presenters. OCL will present “The Assembly of Bishops and the Future of Orthodoxy in America” on Saturday November 2 at 9:00 am at Holy Trinity Serbian Orthodox Church, Moraga, CA. 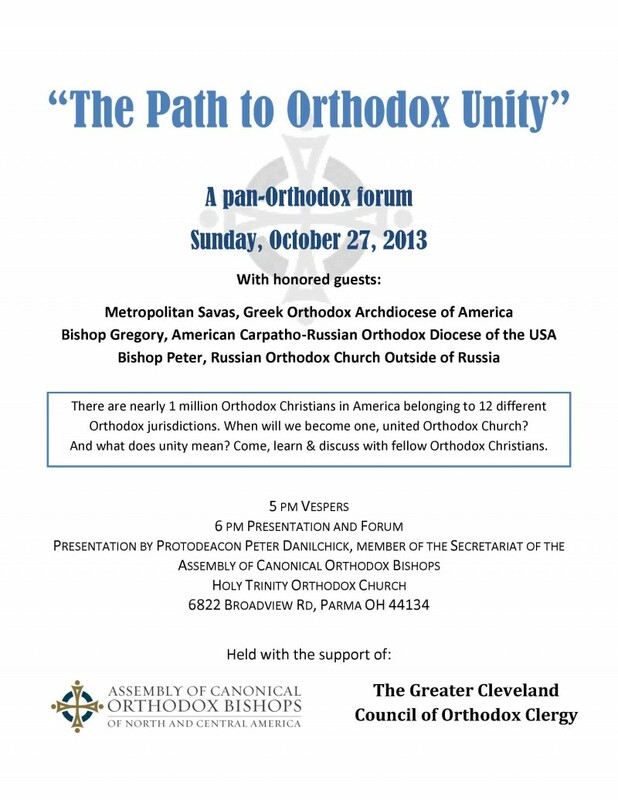 The Orthodox Christian community of Cleveland, Ohio will host a public forum on the Assembly of Bishops and the future of Church unity in America on Sunday, October 27, 2013. The program will begin with Vespers followed by a presentation by Protodeacon Peter Danilchick, member of the Secretariat of the Assembly of Bishops. Protodeacon Danilchick will discuss the history of the Assembly, its goals, and highlights from the fourth annual meeting in Chicago. Three hierarchs—Metropolitan Savas (GOA), Bishop Gregory (ACROD), and Bishop Peter (ROCOR)—are expected to attend. Following the presentation, clergy and laity will have an opportunity to ask questions about the Assembly and discuss the future of Church unity. The forum, which was planned by Cleveland-area laity, has received the blessing and support of the Assembly of Bishops and the Greater Cleveland Council of Orthodox Clergy. It is the Assembly’s hope that the forum will serve as a model to be replicated in other cities, as a means to promote pan-Orthodox understanding and dialogue about the Assembly and its mission. The Cleveland event will begin at 5 pm on October 27 at Holy Trinity Orthodox Church, 6822 Broadview Rd, Parma, Ohio. The event is free and open to the public.